Navajo Lake was formed after construction of Navajo Dam across the San Juan River, which starts in the San Juan Mountains in Colorado, flows south into New Mexico and across the northern edge of the state past Farmington, Shiprock and Four Corners then on into Utah where it forms the goosenecks of Goosenecks State Park. 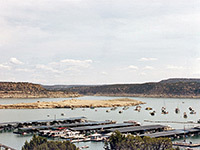 The waters of Navajo Lake have backed up some 30 miles upstream of the dam along the river plus lesser distances along various tributaries so although all branches are quite narrow, the lake has a considerable area, and is mostly used for boating and fishing. Vehicular access is limited as there is only one main approach road (NM 539), that crosses the dam at the southeast corner of the lake, plus another gravel track (NM 527) to the Sims Mesa area a little way east. Other parts of the shoreline can only be reached by a network of rough tracks across hilly, rocky terrain, though the far north end, over the Colorado border, is also close to a main road (CO 151). This part of the lake is outside the state park, and within the Southern Ute Indian Reservation. The approach along the main highway (539/511) is similar from either east or west. The roads are paved but bumpy and in bad condition, crossing drab, dusty land of small ravines and low bushy hills. NM 511 follows the San Juan River for a while then climbs up and over the earthen Navajo Dam and on to the main state park area (entrance $5 in 2015) which is situated to the right, reached by a short side road, and includes a busy marina with floating pontoons, campsite, grocery store, picnic area and ranger station. The surroundings are quite scenic - an expanse of blue water, small sandy beaches separated by vertical cliffs of whitish limestone with rocky slopes and ledges above. The beaches are nice and have clean, soft sand, colorful pebbles and no mud, but those near the marina have large amounts of litter so it is best to walk along the shore (northwards) for 20 minutes or so to find sites less visited.